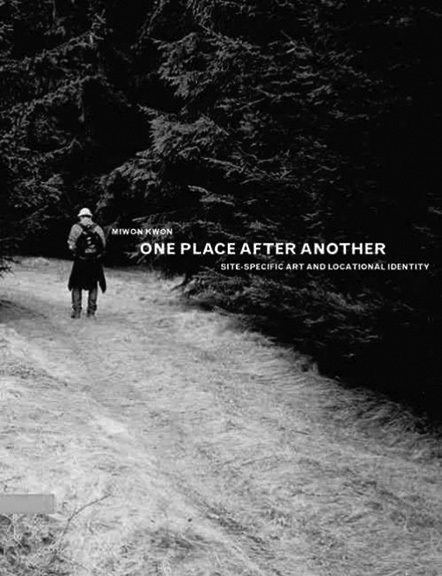 In her book One Place after Another: Site Speciﬁc Art and Locational Identity (2002) Miwon Kwon outlines a unique view of the evolution of ‘site speciﬁc art’ from the 1960s onwards. The way in which she lumps the most divergent art practices with a conscious relationship to ‘place’ into the ‘site-speciﬁc’ category takes some getting used to. In the process she uncovers a complex battleground of the evolution of the concept and practice of ‘site speciﬁcity’. After a fascinating historical description, she turns to the development of site-speciﬁc art in the public domain. She relates her research and her ﬁndings to urban theory, postmodern criticism in art and architecture, and especially the present-day debate on the vanishing city and the unstable relationship between place and identity: the ‘disappearance of site’. Kwon makes clear the importance of art’s relationship to place. And with a thorough analysis, she hopes to create room for the representation of new coordinates for the relationship between art and ‘site’. Kwon describes the development of ‘site speciﬁty’ using three paradigms, in which she attempts to sum up history and the present. The ﬁrst, ‘phenomenological’ paradigm is related to the original site-speciﬁc art of the late 1960s and early 1970s, in which the ‘site’ was the starting point and reason for being of the artwork. The physical place and artwork were inextricably linked. Within the second, ‘social’ or ‘institutional’ paradigm, ‘site’ is formed by a much broader framework, with the focus on the social, economic and cultural-political conditions in which art is produced and presented. The dematerialization of the ‘site’ and of the artwork which begins here continues in more recent art practices, summed up in the third, ‘discursive’ paradigm. Within this, artists expand their ﬁeld of operation, in the sense of location, form, content and function, far beyond the context of art. Often social issues are the focus. ‘Site’ can now also be an area of knowledge, an intellectual exchange or a cultural debate. Kwon sums up the evolution she describes as a shift from a sedentary model to a nomadic model, a shift from a close relationship to a steadily looser, more unstable relationship between subject / object and place. Because her theory encompasses not only the artwork but also the artist’s practice, this leaves room for experimental artistic practices that, measured by traditional criteria of artworks, fall outside the boundaries of art. Three extensive case studies, Richard Serra’s Tilted Arc, a John Ahearn commission for South Bronx Sculpture Park, and the exhibition ‘Culture in Action’ (1993, Chicago) bring Kwon to call for a reconsideration of previously outlined models of ‘site speciﬁcity’. The cases show the precarious relationship of the art projects to a stubborn practice within the public domain. To Kwon, treating ‘community’ as a social coherence is a serious misconception. This misconception is due to the failure of many of these interactive practices. She elaborates this using the exhibition ‘Culture in Action’ by Mary Jane Jacobs, to her a textbook example of the political and activist ‘New Genre Public Art’, which lays a strong emphasis on interaction between artists and ‘communities’. The practice of New Genre Public Art is based on a protest against the exclusion of individuals and groups. A political aspiration to democratization is of fundamental importance here, ‘to empower the audience’. Art should also become the property of the man in the street: ‘real place’, ‘real people’, ‘real problems’. It is a form of public art that, at this level and with this political as­piration, is inconceivable in the Netherlands. In her analysis of the eight projects comprising ‘Culture in Action’, Kwon thus focuses acutely on the way in which the relevant groups / communities were assembled, deﬁned and approached by the artist, curator or art institution. Was the group approached as socially coherent? To what extent did a reductive picture of the identities of the participants emerge, whereby essential differences, particular characteristics and interests were left out? Difference, heterogeneity and instability, to Kwon, are by deﬁnition intrinsic to every community. This realization must serve as the basis for any inter­action between art and a commun­ity. Based on this realization, Kwon proposes a different model of collectivism and ‘belonging’, conceived not out of ‘common-being’ but out of ‘being-in-common’. She outlines a collective artistic practice she dubs ‘Projective Enterprise’: this is also predicated on the groups assembled for the occasion, whereby she calls for the people involved to be constantly conscious that every aspect of the interaction is constructed and mediated. However, Kwon’s ‘Projective Enterprise’ seems closely modelled on New Genre Public Art as she describes it. She makes a stand for the further development and reconsideration of ‘community art’, but it is too early to speak of a new model. In the closing chapter Kwon draws a direct link between the disappearance of the physical place in ‘site-speciﬁc’ art practice and the unravelling of the relationship between subject / object and place. Kwon sees a task for art to fulﬁl within the problems of contemporary existence and the signiﬁcance of the modern city against the background in which this unravelling is taking place, as long as art is capable of inventing a new model for the art-place relationship. Site-speciﬁc art can function as a cultural mediator, although Kwon is also conscious of the risk of interpreting site-speciﬁc art as a melancholic discourse: the recognition of the loss of ‘place, but no solution for the loss of place’. According to Kwon, it seems historically inevitable that we discard the nostalgic notion of ‘site’ and identity, connected in essence to an actual place. At the same time, the yearning for this close constant relationship, which is related to the experience of identity and safety, will never go away. The model that Kwon proposes for art therefore encompasses the nostalgic yearning for ‘place and identity’ as well as the recognition of an unstable (nomadic) relationship between subject and place: the notion of ‘the wrong place, belonging in transience’, ‘to be out of place with punctuality and precision’. So far Kwon’s proposal is easy to follow and interesting. From this point, however, her argument becomes unclear. To apply this model within the public domain, she seems to bring out the traditional, presumed expertise of art: ‘Thus, in its ﬁnal pages the book can only conjure up the critical capacity of intimacies based on absence, distance, and ruptures of time and space.’ Does she mean the presumed capacity of art to reinforce emotions and experiences to the point that can be exercised within the ‘safe’ area of art? Is she identifying an art in the public space that, through models, can teach a critical attitude toward the proximity of absence, distance, ruptures in time and space? That would be worth reﬂecting upon. But is this in fact what she has in mind? Her examples, after all, show that art is not easily tolerated in the urban public space, and perhaps cannot help developing as a ‘democratic art’. And does this not mean that, by deﬁnition, art must sacriﬁce its instability, unrest and unease in favour of accessibility – qualities that are characteristic of a nomadic constellation? Kwon’s exposition elicits yet more questions. For instance, does she not excessively ascribe her theory to a supposed practice? It is also odd that Kwon’s research into art practice stops in 1993, while she is proposing a different model for art in the public space based on this research in 2002. In that intervening decade, in facet, an entirely new model for art and participation has been developed by a new generation of artists and theorists such as Nicolas Bourriauld, Hans Ulrich Obrist, Rirkrit Tiravanija, Jeanne van Heeswijk, Alicia Framis, Marius Babias, Florian Waldvogel, to name but a few. Nevertheless Kwon’s book offers clariﬁcation and food for thought, especially in relation to interactive / participative art and public space. Perhaps her method of ‘Projective Enterprise’ and her essential model of ‘the wrong place’ is not suited to the great public urban domain; perhaps its potential rests primarily on small communities, in fact. Dees Linders is a project coor­dinator with SKOR, Amsterdam.